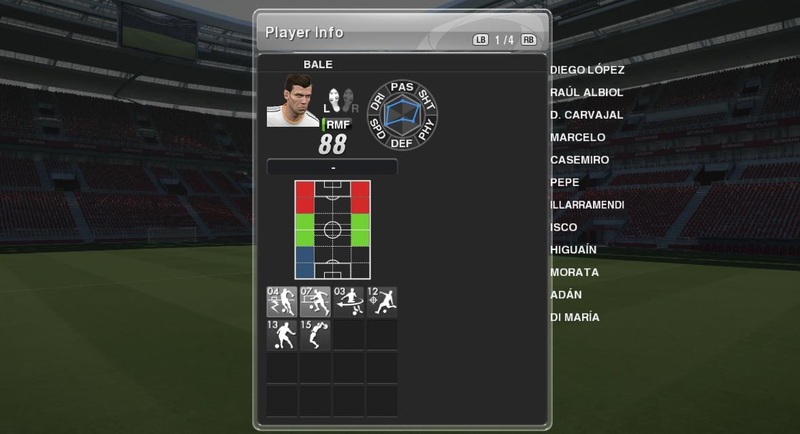 Welcome to PESMastery PES 2014 Player Skills Guide. 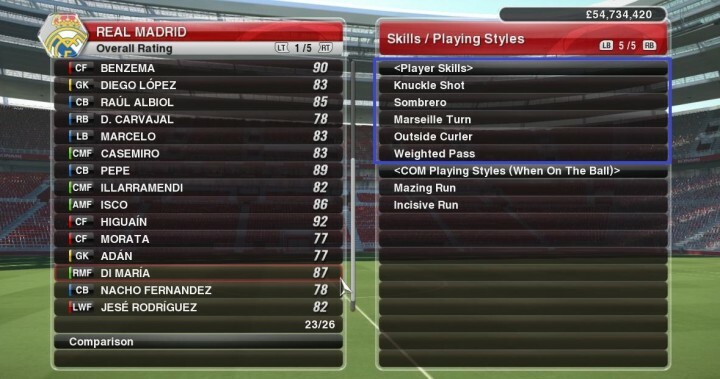 Also known as PES Player Index Cards, Player Skills card show you the type of dribbling and technical skills each player can perform. Knowledge on Player Skills, together with Playing Styles, will give you a better idea if the player is a good addition to your team. There are 2 types of Player Skills card. The first series of cards are applicable when the players controlled by the AI. You will only see the effect of these cards when these players are your AI controlled opponents, or AI controlled teammates. E.g An AI controlled player with the ‘Trickster’ skill card is more likely to attempt dribbling tricks. The second series of cards enables the player to execute certain skills when you are directly controlling them. 7 player skills cards fall into this series. 01 Trickster – The step-over expert who makes the most of exquisite skills to dribble past the opposition. 02 Mazing Run – A player who looks to penetrate deep into opposition territory by using deft turns and dribbles. 03 Speeding Bullet – A pacey player who likes to get forward. 04 Incisive Run – A dribbler whose expertise is to cut in from the wide areas looking for goal scoring opportunities. 05 Long Ball Expert – A player who frequently plays the long ball. 06 Early Cross – A player with great vision who won’t miss the chance to hit an early cross. 07 Long Ranger – A player who frequently takes snapshots at goal from range. 20 player skill cards allow you to pull of dribbling tricks and technical skills with the players in possession of these cards. 01 Scissor Feint – Enables players to execute the Scissors Feint at high speed. 02 Flip-Flap – Enables players to execute the Flip Flap. 03 Marseille Turn – Enables players to execute the Marseille Turn. 04 Sombrero – Enables players to execute the Boomerang Trap and the Crescent Turn. 05 Precise Touch – Enables players to use a wider range of skills including the “Cut Behind”. 06 Long Range Drive – Enables players to hit curling shots with great accuracy from a distance. 07 Knuckle Shot – Enables players to hit knuckle ball shots with greater ease. 08 Acrobatic Finish – Enables players to find a finish even from awkward positions or when off balance. 09 First-Time Shot – Improves technique and precision when taking first-time shots. 10 One-Touch Pass – Improves technique and precision when playing one-touch passes. 11 Weighted Pass – Enables players to apply back-spin when playing lofted passes and through balls improving accuracy. 12 Pinpoint Crossing – Enables players to curl in crosses with great accuracy. 13 Outside Curler – Enables players to shoot and pass using the outside of the boot even at long distances. 14 Low Punt Trajectory – Enables players to take long accurate punt kicks with a low trajectory. 15 Long Throw – Improve the range of long throws. 16 GK Long Throws – Improves the range on throws by the goalkeeper. 17 Man Marking – Makes the player stay tight on the opponent when marking. 18 Track Back – An offensive player who actively pressurises the opposition player who is on the ball and tries to win it back. 19 Captaincy – The strength of character to get more out of the team, pulling players by the scruff of their necks. 20 Super-Sub – Improves player’s abilities when introduced late in the game. 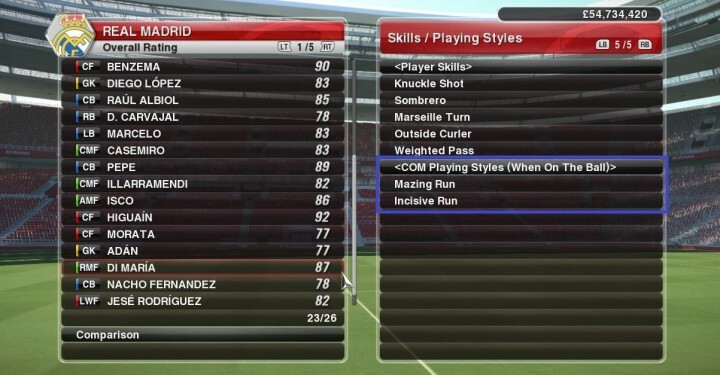 COM Playing Styles cards will not be applicable, unless you are playing Coach mode. Other player skill cards will prove handy in the game. In previous versions, most of the dribbling tricks are just flashy and not effective. However, I find that PES 2014 has placed more emphasis in these dribbling tricks, and they are actually necessary and helpful in getting you out of tight situations. Players with these dribbling skills card will be assets to your team. Shooting cards e.g Long Range Drive, Knuckle Shot and Passing cards e.g Weighted Pass, Pinpoint Crossing are some of my favourites, as they allow you to execute accurate shots and passes easily. In general, the presence of these cards help us make better decisions on what to do with our players when they are in possession of the ball. Do you have any favourite player skill cards? Feel free to drop me a comment below. Thanks and enjoy your PES 2014!